Earlier few days back, I did brag about sunscreen for my face. 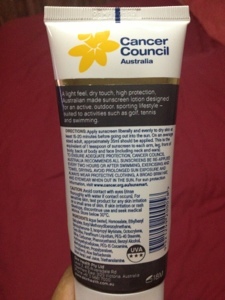 Now this is yet another awesome find for me which is cancer council sunscreen for the body. This can also be used on the face, but I categorized it for the body only. 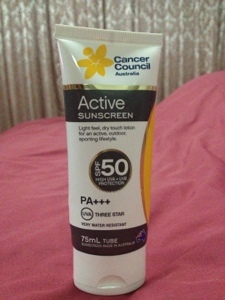 Product Info: Cancel Council SPF 50 PA+++ 75ml "Active" sunscreen tube A light feel, dry touch moisturizing lotion sunscreen cream that rubs on easily. Suitable for an active, outdoor, sporting lifestyle. Product Instruction:Apply sunscreen liberally and evenly to dry skin at least 15-20 minutes before going out into the sun. On an average sized adult, approximately 35 ml should be applied. This is including the back, body, arms, legs and everywhere else. Review: I'm always on the hunt for a good sunscreen for my body. 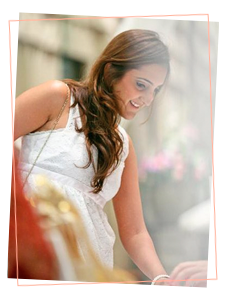 It is fragrance free and developed for sensitive skin. I've been using it for three weeks now and my skin is fine with it. It really does have no fragrance, it doesn't even smell like sunscreen. It is very slightly drying on the skin, but many zinc oxide sunscreens are. I already have my second back up. Will surely continue to use this for a long while.